A preservative, the inclusive term for several aluminum-typecompounds such as aluminum sulfate and aluminum potassiumsulfate. It is used with EDTA to prevent discoloration of potatoesand to maintain the firmness of shrimp packs. It is also used in picklesand pickle relish. Alum Powder is not used for its flavor, but for its chemical properties in pickling and baking. Pickling Spice,Calcium Chloride Food Grade, Ascorbic Acid Vitamin C Powder, Cream Of Tartar, Arrowroot Powder and Citric Acid. Alum is frequently used in the purification of drinking water in industries. It is dissolved in the water tanks which make the colloidal parts heavy so that they can easily be removed. This makes way for further purification of water. It is most commonly and frequently used as an after-shave. Applying powdered alum mixed with a little water or in the crystallized form over the face while it’s still a little wet, aid in blood clot on the minor cuts that occur from shaving. During the end of 16th century, it was commonly used as a base in many skin whiteners and in treatments for sunburns. Alum powder is known to keep the body odor in check as it is easily soluble in water and eliminates the odor causing bacteria. This explains as to why it is used as one of the primary ingredients in the manufacturing of deodorant sticks. Alum is used as a soothing agent to be applied on the freshly waxed skin. 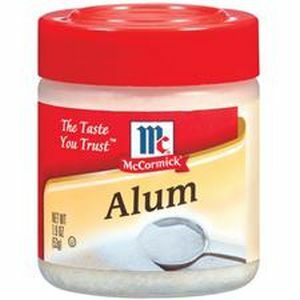 Alum is used as a readily available remedy for the treatment of mouth ulcers. Applying a pinch of alum powder on the ulcers will relieve the pain and heal them. It is also used as an ingredient in many toothpastes and toothpowders as it helps in maintaining a good oral hygiene. Alum is used as a preservative when making pickles out of fruits and vegetables as it maintains the crispiness in them. Many baking powders involve alum powder as an ingredient for providing the acidic content in them. Alum is consistently used for its flame retardant properties as it’s found in many fire extinguishers and is also used with clothes, wood, and paper materials to increase their resistance to fire. Alum is also known for its acne fighting properties when mixed with other ingredients like rosewater or egg white.